Decarie, Graeme. 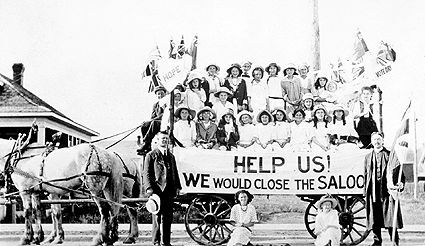 "Temperance Movement in Canada". The Canadian Encyclopedia, 08 June 2018, Historica Canada. https://www.thecanadianencyclopedia.ca/en/article/temperance-movement. Accessed 22 April 2019. The temperance movement was a social and political campaign of the 19th and early 20th centuries, advocating moderation or total abstinence from alcohol, prompted by the belief that drink was responsible for many of society’s ills. The mass movement was international in scope. 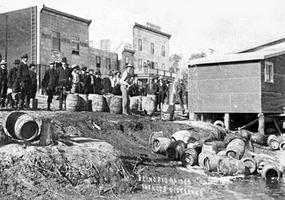 Liquor barrels emptied into the lake at Elk Lake, Ontario, during Prohibition (courtesy PAO/S15001). The temperance movement was a social and political campaign of the 19th and early 20th centuries, advocating moderation or total abstinence from alcohol, prompted by the belief that drink was responsible for many of society’s ills. The mass movement was international in scope. In Canada it led to a series of calls for legal prohibition of alcohol. The first temperance societies in Canada appeared around 1827 in Pictou County, Nova Scotia, and Montréal. The groups initially tolerated moderate use of beer and wine, a concession which was to continue in Québec but soon gave way in the rest of the country to calls for total prohibition of all alcohol. Despite the shift from temperance to prohibition, organizations that promoted temperance, abstinence and prohibition were all commonly referred to as temperance groups. Around 1848, the Sons of Temperance lodge, a fraternal and prohibitionist society, reached Canada from the United States. Other such lodges were the Royal Templars of Temperance and the International Order of Good Templars. The most important temperance society for women was the Woman's Christian Temperance Union, an American group whose Canadian counterpart was founded in 1874 by Letitia Youmans of Picton, Ontario, as one of the few organizations through which women could play a political role. In 1875, the hundreds of societies, lodges and church groups committed to prohibition convened at Montréal to form a federation named the Dominion Prohibitory Council. A year later it was renamed the Dominion Alliance for the Total Suppression of the Liquor Traffic, and it became the major organizing force for prohibition campaigns. The predominantly English-speaking, Protestant alliance discouraged francophone and Catholic participation. Furthermore, Catholics, particularly francophone Catholics, regarded prohibition as an extreme measure. When La Ligue Anti-alcoölique was formed in 1906 as a French-language counterpart of the Dominion Alliance, it supported legal restriction of the liquor trade, but not full prohibition. Jurisdiction over the liquor trade was shared by governments. The provinces could prohibit retail sale, while the federal government could ban manufacturing of alcohol and retail, wholesale and interprovincial trade. However, governments at neither level were enthusiastic about prohibition, since it would cause loss of tax revenue and party support. Both levels put forward compromise legislation known as "local option," a power granted to local governments to hold popular votes to create laws on contentious issues in their areas. The process was enshrined in the Canada Temperance Act of 1878, which gave local governments the right to hold votes to ban the sale of alcohol. A side effect was to give prohibitionists political experience, through organizing local-option and referenda campaigns. Prohibitionists secured a major victory in 1900 when Prince Edward Island outlawed the retail sale of alcohol throughout the province. When the First World War broke out, the temperance movement was close to its peak. Alcohol consumption, though beginning to rise after a half century of decline, was relatively low; organization and funding for the movement were substantial; and local governments widely banned alcohol through local-option votes. At the outset of the war, the Dominion Alliance successfully campaigned for prohibition as a patriotic measure, to preserve time and money for the war effort. In 1915 and 1916, all provinces but Québec prohibited the sale of alcohol. Québec banned retail sale of distilled liquor in 1919, but only briefly. Prohibition as a wartime measure was short-lived. A federal ban on manufacturing, importing and selling alcohol expired soon after the war ended. Most provincial legislation was subsequently repealed during the 1920s in favour of allowing governments to control alcohol sales. PEI was the last holdout, prohibiting alcohol sales until 1948. Meanwhile, Canadian liquor interests found a large market in the United States, which was under federal prohibition until 1933. A Canadian law rooted in the Prohibition-era, the 1928 Importation of Intoxicating Liquors Act, remained intact until 2012 when it was amended by the federal Parliament to allow consumers to bring limited amounts of alcohol across provincial boundaries for personal use. There are several theories about why the temperance movement waned and prohibition laws failed: They were criticized for distorting economic activity, for encouraging drinking (the opposite of their intended effect), and for encouraging gangs of criminals. Perhaps more likely, there were changes in Canadian society and within the temperance movement itself that likely led to its downfall. Self-employed Canadians who saw temperance as an aid to economic success were a diminishing part of the population, displaced by urban, wage-earning workforces. Within the movement, prohibitionism had provided an opportunity for close study of urban problems, leading many to conclude that those issues had more to do with the political and economic system than with alcohol. Many left the movement for other forms of activism. It had been thought that the extension of voting rights to women (see Women's Suffrage) would sustain prohibition, since it was believed that women were sympathetic to the cause. However, referenda of the 1920s, in which women had the vote, showed a consistent decline of support. The temperance movement was the creature of a society that was already fading when its prohibition victories were won. M.G. Decarie, "Something Old, Something New," in Donald Swainson, ed, Oliver Mowat's Ontario (1972); The Facts of the Case: a summary of the most important evidence and argument presented in the Report of the Royal Commission on the Liquor Traffic (1973); James H. Gray, Booze (1972); R.E. Spence, Prohibition in Canada (1919).